The decision was in part after the killing of a Washington Post columnist. When the ball drops on New Year’s Eve in New York City's iconic Times Square, it will be dedicated to protecting press freedom and celebrating the importance of journalism. The Times Square Alliance and Countdown Entertainment have named the Committee to Protect Journalists -- the media watchdog group that released its annual prison census findings this month -- as this year’s charity honoree. (Darrin Zammit Lupi/Reuters) A person holds a sign depicting the murdered anti-corruption journalist Daphne Caruana Galizia, at the site where she was assassinated with a car bomb one year ago, in Bidnija, Malta, Oct. 16, 2018. Tompkins told ABC News the alliance first considered the dedication after Washington Post columnist Jamal Khashoggi was killed inside of the Saudi embassy in Istanbul, Turkey. The recognition comes as several world leaders, including President Donald Trump, have lashed out against journalists in 2018. The U.S. president has repeatedly referred to the press as the "enemy of the people" and described their work as "fake news." In the Philippines and Russia, too, Presidents Rodrigo Duterte and Vladimir Putin, respectively, have echoed Trump's apparent disdain for the media. It was against that backdrop of criticism that the Times Square Alliance decided to honor journalists at the Crossroads of the World on New Year's Eve. In addition to the killing of Khashoggi, the deadly shooting in June at the Capital Gazette newsroom factored into the decision to dedicate the night to journalists. 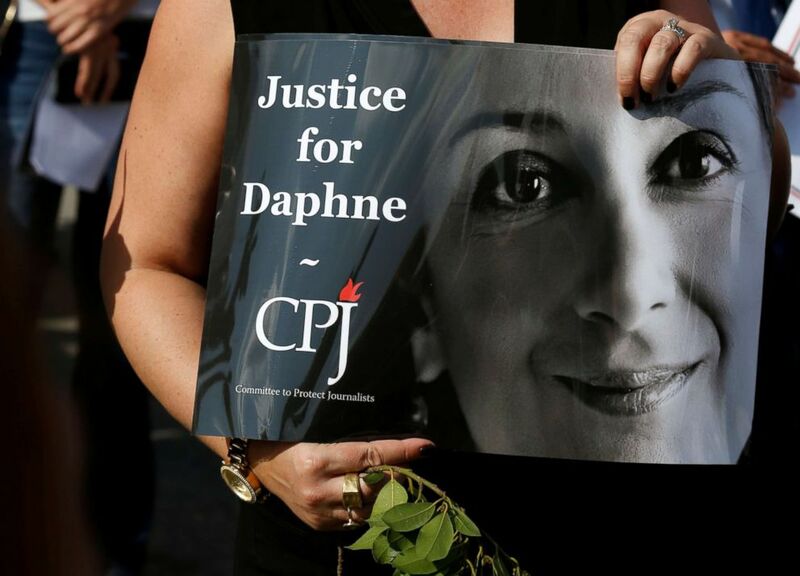 “That was the real frightening moment for journalists throughout the U.S., to realize there is a level of animosity towards journalists that we need to be aware of,” Tompkins said. 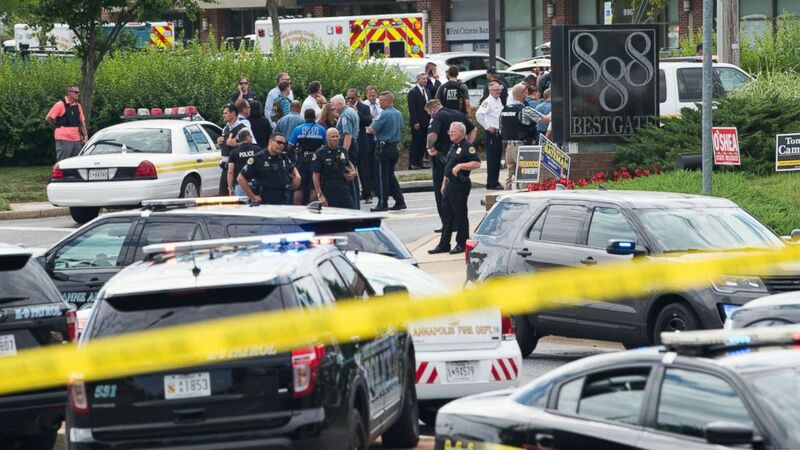 (Saul Loeb/AFP/Getty Images) Police respond to a shooting at the offices of the Capital Gazette, a daily newspaper, in Annapolis, Md., June 28, 2018. Despite his battles with members of the media, Trump publicly offered sympathies for the Capital Gazette victims. “My thoughts and prayers are with the victims and their families," he tweeted. Partnering with the Committee to Protect Journalists allowed for a global perspective to the issues of press freedom. On Dec. 13, the watchdog organization published its Annual Prison Census, which found that 251 journalists were currently imprisoned around the world as of the beginning of the month. Also, the number of journalists around the world imprisoned on charges of false news rose to 28, the report found, up from nine two years ago. (Moises Saman/AFP/Getty Images) This image obtained on Dec. 11, 2018, courtesy of Time magazine shows Saudi journalist Jamal Khashoggi on one of four covers for Time magazine "Person of the Year." 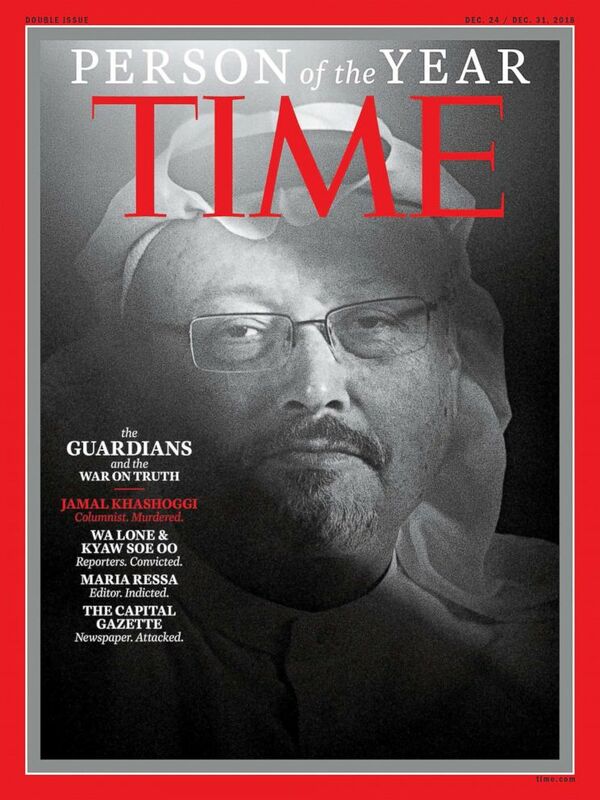 TIME Magazine also dedicated its “Person of the Year” to journalists who have been killed or persecuted around the globe, including Jamal Khashoggi, the victims of the Capital Gazette shooting and others. On New Year's Eve, journalists from major media organizations are being invited to the main stage for the "Special Guest" moment, a distinction typically reserved for glitterati and prominent leaders. 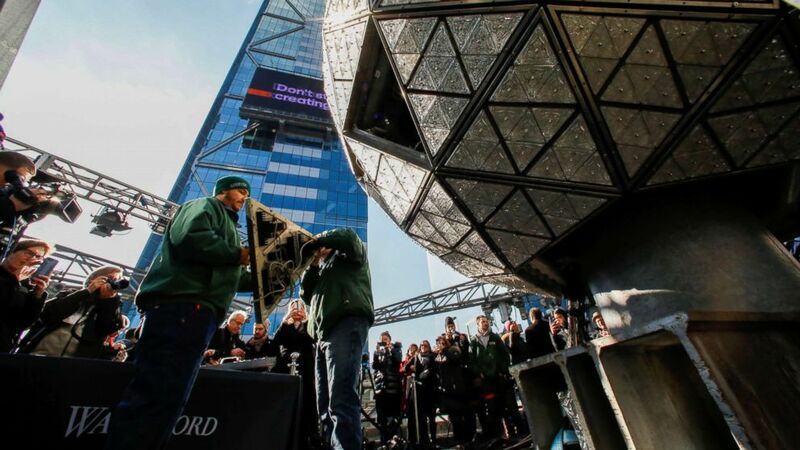 (Eduardo Munoz/Reuters) Workers get ready to install Waterford Crystal triangles on the Times Square New Year's Eve Ball on the roof of One Times Square in the Manhattan borough of New York, Dec. 27, 2018. Martha Raddatz, ABC News' chief foreign affairs correspondent, will be among the 11 journalists who will press the button and ring in 2019. Others who will take the stage include NBC Nightly News' Lester Holt and Karen Attiah, who was an editor for Khashoggi and is the global opinions editor for The Washington Post, among others. Tompkins insists that, in spite of the precipitating events this year, the biggest party in the world is dedicated to bigger ideas.